U.S. Rep. Mikie Sherrill (L'07)(D-N.J.) returns to Washington, D.C., as a member of Congress. Mikie Sherrill (L’07) has had an exciting life so far: Naval Academy graduate, helicopter pilot in Europe and the Middle East, Russian policy officer, student of Arabic in Cairo, London School of Economics graduate, and assistant U.S. attorney. And as of first week in January, she’s added one more accomplishment: U.S. Representative from the 11th District of New Jersey. Sherrill, a Democrat, was elected in November on a platform that appealed to voters: addressing transportation/infrastructure issues and climate change, tax relief for middle class families, access to affordable healthcare and preventing gun violence. She has also expressed concern for the integrity of America’s democratic institutions and our standing in the international community. Sherrill, 47, is one of the first two female Naval Academy graduates elected to the U.S. House of Representatives. She is also the mother of four young children and the eldest in a family of sisters committed to serving their communities. “It was always important to me to have a job that had a broader mission than just a paycheck,” said Sherrill. Georgetown Law was a natural fit for Sherrill, who was raised Catholic with an understanding that she should be giving back to others. “I think the Jesuits are the epitome of that kind of teaching,” she said. As a member of Congress, Sherrill brought a slate of constituent issues with her to Washington, but the government shutdown quickly rocketed to the top of the list. “This shutdown is so harmful to a lot of families. It’s a role and responsibility of Congress to get the government back open,” she said. On the day of her swearing in, January 3, Sherrill hit the ground running, casting her first two votes in favor of appropriations bills to fund the government in 2019 and end the shutdown, then in its second week. Since then, she’s scheduled her first town hall meeting back home in New Jersey, co-sponsored a bill supporting universal background checks before firearm purchases and received an assignment to the House Armed Services Committee. Passage of the T-HUD Appropriations Bill (H.R. 267, the Transportation, Housing and Urban Development, and Related Agencies Appropriations Act, 2019) is a big priority. The bill provides for funding of Amtrak’s Northeast Corridor and the Gateway Tunnel, which would link Northern New Jersey and Manhattan, replacing the aging Hudson River Tunnel that currently carries 200,000 commuters back and forth every day. Calling the tunnel project “the most vital infrastructure project in our nation,” Sherrill gave her first floor speech to Congress on the issue just seven days after taking office. 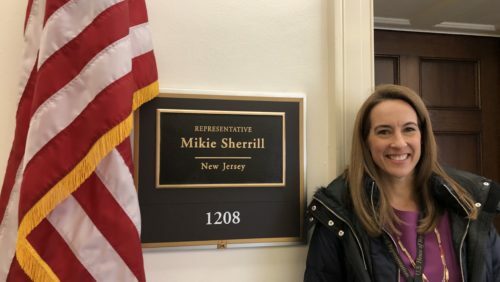 So far, Sherrill is learning the rules of legislating in D.C. while being a consistent presence for her constituents back home in New Jersey.